(CNN) -- For three months, Hakimullah Mehsud was supposedly dead, killed in a U.S. drone attack in the mountains of Pakistan, according to Pakistani officials. Then word came last week from intelligence sources in Pakistan that he had not after all been killed, that he had been injured but not seriously. And within days of that news, not one but two messages followed from Mehsud himself, both purportedly recorded in April. They warned of imminent attacks by the Pakistani Taliban, known as Tehrik-i-Taliban Pakistan or TTP, on unspecified targets in the United States. U.S. intelligence and counterterrorism officials remain very skeptical about any TTP involvement in the weekend's attempted car bombing in New York. One senior official said it would be "an enormous surprise" if they were involved. The TTP has shown little appetite or capability for operating beyond Pakistan and Afghanistan, though it was linked to a suicide bombing plot that unfolded in Spain and was broken up in 2008. But Mehsud is back in action, courting publicity again. Whether he is still the leader of the TTP is an open question. Last week, while U.S. officials said they still weren't sure whether he was dead or alive, Defense Department spokesman Geoff Morrell said, "I certainly have seen no evidence that [Mehsud] is operational today or is executing or exerting authority over the Pakistan Taliban as he once did. So I don't know if that reflects him being alive or dead, but he clearly is not running the Pakistani Taliban anymore." But in light of the video that surfaced over the weekend, that assessment may have to be revisited. Mehsud's résumé reads like that of the "fast-track" jihadist. He is about 30 years old and charismatic on camera in a way similar to fugitive U.S. preacher Anwar al-Awlaki. 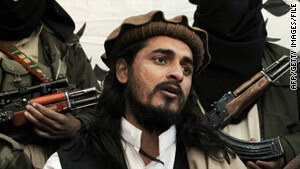 He comes from a clan in the restive South Waziristan area of Pakistan that has a long record of involvement in jihad. The FATA Research Center in Pakistan, which has tracked his career closely, says his two brothers were killed fighting Pakistani troops in South Waziristan in 2008. Mehsud himself joined the TTP in 2003 and fought in Afghanistan before becoming spokesman for the leader of the group, Baitullah Mehsud, say analysts in Pakistan. But in the age of drone attacks, the life expectancy of a Taliban commander is uncertain. Baitullah Mehsud was killed in a drone strike in 2009, and Hakimullah Mehsud succeeded him. He had shown considerable flair for military operations, and according to Mansur Khan Mahsud, director of the FATA Research Center in Islamabad, he had a fearsome reputation. "Temperamentally, Hakimullah was a hothead. He angered very easily, did not tolerate opposition and was reputed to be arrogant and prone to emotional outbursts," Mahsud wrote in Foreign Policy. "He was rumored to have shot several men, including some in the Taliban, who disagreed with his orders." As leader of the TTP, Mehsud's greatest "achievement" was orchestrating the suicide bombing of the CIA base in Khost at the end of last year, which killed seven CIA employees and contractors. A man identified by Pakistani officials as Mehsud appeared with the suicide bomber in a video that was released soon after the attack. "This is a message to the enemies of the [Muslim] nation: the CIA and Jordanian intelligence services," the bomber said, with Mehsud at his side. Mehsud's well-documented love of the camera nearly cost him his life. He became a top target for retribution by the United States. On January 15, he was wounded in a drone attack. Subsequently, U.S. and Pakistani officials said intelligence reports indicated that it was virtually certain that he had died of his wounds. Local tribal chiefs even reported attending his funeral. The Taliban persistently denied that he had been killed. At the time of the reports, U.S. envoy to Afghanistan and Pakistan Richard Holbrooke said of Mehsud: "He's a very bad person. He either is or was a very bad person, and either way, he's as bad a person as there has been in this region for a long time." For now, it seems, we need to revert to the present tense in describing Hakimullah Mehsud.